Apr 7, 2016 – The legendary film “A Sunday In Hell,” the quintessential documentary on the Paris-Roubaix classic, turns 40 this year. Directed and produced during the 1976 race, Danish director Jorgen Leth was one of the first international figures to champion the sport of cycling, then seen as a sport limited only to a handful of European countries. But while Leth has produced a diverse array of films over the past 50 years (ed. 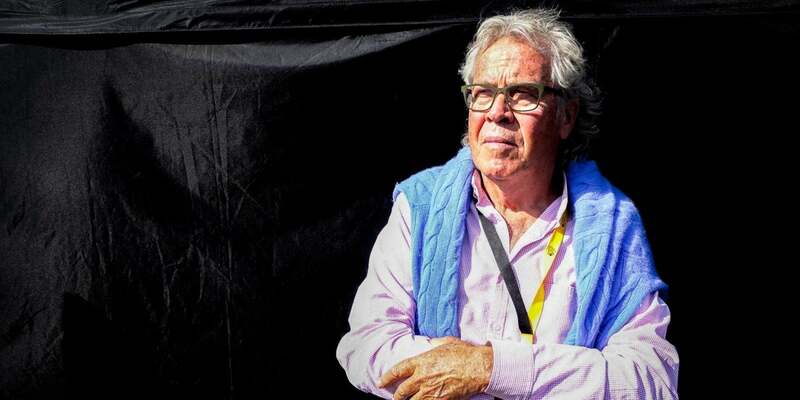 his films are in constant rotation in film festivals around the world) and has inspired a generation of Danish film makers including Lars Von Trier, the 78-year-old Leth has always remained a fervent cycling fan. We caught up with the internationally-acclaimed director to talks about his life-long passion for the world’s most grueling classic. peloton magazine: Jorgen, you were one of the first people in the media really celebrate cycling on an international scale. Where did this interest come from? Jorgen Leth: Well I just thought cycling was an amazing sport. “A Sunday in Hell” was actually my second film about cycling. I had done “Stars and Watercarriers” two years earlier at the Giro d’Italia, but I really wanted to do a film about Paris-Roubaix. peloton magazine: Did you ever think that “A Sunday in Hell” would become the cult classic it has become? peloton magazine: Hmm, sort of like the way the directors of the French New Wave held such American B-Movies in such high regard. peloton magazine: What was it about Paris-Roubaix that attracted you? Jorgen Leth: It was the impossibility of it all. It was almost crazy to do a film there because it is so difficult and dangerous. It’s so uncontrollable in so many ways. That attracted me, to do something impossible. I’ll never forget, Felix Levitan (i.e. then the race director) said right from the beginning, “You can’t film Paris-Roubaix! It’s too dangerous. I just can’t allow you to do that.” And I told him, “That’s exactly what attracts me. I want to do a film about your crazy race!” I had 28 cameras on hand that day. And I did it! peloton magazine: Did the race correspond in some ways to your own approach to cinema? Jorgen Leth: Yes very much. With each film, you must find a new set of rules to tell the story. You have to invent ways to approach it. And Paris-Roubaix provided plenty of challenges. peloton magazine: So you change your set of rules with every film? Jorgen Leth: Yes, absolutely! But there has to be rules in filmmaking, otherwise it becomes cheap. That’s sort of a point of departure for me. peloton magazine: Are there any golden rules for you when it comes to filmmaking? Jorgen Leth: Yes there are some. One very important thing for me is that, when you have a good frame, you keep it. Don’t change it. Several of my cameramen broke that rule on “A Sunday in Hell,” but that is something that is very important to me, and most of the footage in the film abides by that rule. Most of my cameramen were very good at staying with the frame. It’s contrary to what many cameramen like to do today. Many cameramen today are constantly changing their shot, narrowing it during the shot. But that’s wrong. In my opinion you should not change the frame during the shot. It is very important to stay true to time. Time is a real thing. Time is from here to there. And I don’t want to fuss with that! I want to keep the reality and intensity of time. peloton magazine: In that sense, a bike race is a perfect subject for you, because a bike race takes so much time compared to many sports. Cyclists can just roll along on flat road for hours without changing their frame, much like they do in the opening kilometers of Paris-Roubaix. Jorgen Leth: Yes absolutely. I bike race takes time. And I want to show that. peloton magazine: Interestingly, even when the racing gets crazy, in the final kilometers, when there are crashes, flats and attacks, you maintain this perspective. You maintain this sense time amid the chaos. Jorgen Leth: Yes. And I continued even after the riders cross the finish line. That’s a constant for me. There is a scene in one of the last cobble sections. The cameraman is standing at a corner when the first four riders come through, but he keeps his frame, simply waiting for the next riders to pass. It gives the sense of time that a spectator experiences. And I like that kind of reality. peloton magazine: “A Sunday in Hell” came out 40 years ago, and you have often covered the race as a commentator for Danish television. How has the race changed in 40 years, or perhaps I should ask first, has the race changed in 40 years? Jorgen Leth: I think not. And I’m happy say that. That’s what I like so much about Paris-Roubaix. It is timeless. There are still the same cobbles. It’s still just as hard. There are the same rules. Your race can be over in a minute due to a mechanical or a crash. It’s a hard, hard race, with many obstacles. And you can choose to quit or continue. These are hard rules, just like in life. I have a conservative view of the race in the sense that you shouldn’t change it. It’s a beautiful race. And I think the organizers understand that and they fight to maintain the race as it is. They have had to fight to keep the cobbles, and actually got several sections classified as landmarks so they could not be destroyed. They have had to fight to keep the integrity of the race. It has been a political and cultural issue in France to keep the cobbles, but they managed. No, the race has not changed. and it should not change. Many races have changed. Look at the Tour of Flanders. But Paris-Roubaix should not change. It’s a piece of cultural history. peloton magazine: You’ve seen so many of the great champions tackle Paris-Roubaix over the years. Is there one rider in particular that incarnates Paris-Roubaix, the ultimate rider? Jorgen Leth: Oh that would be Roger De Vlaeminck. There have been many greats, but Roger had this ability to photograph what is coming 10 meters up the road. I would say that Francesco Moser had that too. And it is so impressive! They could avoid so many obstacles because they always were aware of what was coming up. But Roger was really the ultimate Roubaix rider. He was a very stubborn man. He is not really a social guy. You never get very friendly with him. He is a very tough guy. But I like him, and that is what made him so good at riding the cobbles. He owned them! He almost had a mean streak and he used it against the worst cobbles. Also he was the race’s first specialist. He almost never rode the Tour de France. But he was the first rider to win Paris-Roubaix four times. And even today, now that Tom Boonen has matched him, Roger for me is still the ultimate. He was like a fish in water on the cobbles. That is the only way to describe it. Moser was like that too. But after Moser, I never saw that again. peloton magazine: It’s funny, Moser gets overlooked these days, but his genius was to win the race three years in a row (1977, 1978, 1979). How impossible is that in a race where chance plays such a big role? Jorgen Leth: Yes. And if De Vlaeminck was the fish, Moser was like a cat on the cobbles. Look at him, he is totally flat on his bike, and he was so quick to react. For such a big guy, it was beautiful to watch on the cobbles. peloton magazine: Were there any pure Paris-Roubaix riders that didn’t win and should have? Jorgen Leth: Oh yes, I would say Lars Michaelson was capable of winning the race on a good day and George Hincapie should have won the race. He was close so many times. Both were so focused on the race, so motivated by it. Both on a good day, could have won. Greg LeMond had a Paris-Roubaix in his legs as well. He was a natural on the cobbles. peloton magazine: And who are you looking to come this Sunday? Jorgen Leth: Oh, well my sentimental favorite is Fabian Cancellara. He too is such a natural. He has been so committed to Paris-Roubaix. Did you see him last week in the Tour of Flanders? For me there were two winners, Peter Sagan, and Fabian Cancellara. He is so beautiful to watch and did you see the way he dropped Niki Terpstra on the Pattersberg? Oh that was beautiful. I don’t like Terpstra. He is way too calculated for me. He’s just a plain rider, strong but calculated. But I am looking very forward to Sunday. I will be commentating for nearly seven hours and I can’t wait! I don’t know what to expect, but I know what I hope for. The main thing I hope for on Sunday is that the race breaks open early so that all of the favorites are just going at it. I’m a romantic when it comes to Paris-Roubaix. I want to see a mano-à-mano. I want to see heroes.